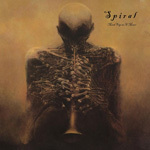 Wrapping your head around Spiral's music isn't all that difficult. But their vivid imagination, that could take some time and resolve. This prolific duo, which has released nine singles and seven albums since 2009, brings atmospheric and ethereal prog rock, near to early space rock. As for the stories or concepts, let's just say that these guys think, well, differently. Spiral: outside their spartan but modern studio. At the very least, Aaron Frale (g,v) Chris Boat (b,k,v) are sci-fi geeks, or better imaginative fiction wonks. The story behind Mind Trip in A Minor certainly flows from the latter. At the Bandcamp link, you can read more about a man traveling in his own mind, or not, finding a beast who eats his own heart, a snake that 'takes half of what he gives,' and girl who seems to save our hero, or not, from the same. 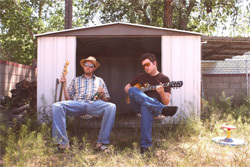 A description of their sound was given away at the start. There's something Seventies about the sound, maybe some Pink Floyd, Nektar, Tangerine Dream or a more creepy Ambrosia. It's at once lush, then also eerie and transcending. Take note of the closing track The Way Out is the Way In. If they leaned towards modern or alternative prog, with their imaginative storytelling, they might be compared to Coheed and Cambria. But not sounding anything like them either. There's some vocals here, but neither player is a vocalist. What you hear is muted or mashed down. The lengthier pieces, Down the Rabbit Hole and The Snake, were better thanks to some nice guitar work. Spiral's Mind Trip in A Minor is equally inspired and entertaining material, a different take on modern prog that reinterprets the past. Recommended.